SmartBasket™ from Pas Reform has been designed specifically to optimise hatchability and uniformity. Genetic selection for high postnatal growth has produced modern broilers that demonstrate much higher metabolic heat production than embryos from traditional breeds. Controlling air temperature to prevent heat stress during incubation is therefore a critically important feature of modern hatchery practice. SmartBasket™ from Pas Reform has been designed specifically to optimise hatchability and uniformity, by delivering a constant air flow over the eggs in the hatcher, which improves the transfer of heat from the hatching eggs to the air. New design! Unobstructed ventilation holes in corner and side wall structure assure uniform air flow in the hatcher, enhancing control of the hatching process for optimum chick viability. With breed selection redefined to further improve egg production and growth rate, the basket’s side walls are higher and volume has been increased to accommodate bigger eggs and larger day old chicks. New bottom design concentrates eggs in the centre of the basket – like a natural bird nest. The resulting contact between eggs enhances communication between hatching embryos, to effectively synchronise hatching and narrow the hatch window. Now incorporating Microban antibacterial product protection: the HACCP compliant, lightweight, easy-clean, ‘food safe’ polypropylene hatcher basket uses the addition of Microban® technology to reduce the risk of cross contamination of food poisoning bacteria by up to 99.9%. UV stabilized to prevent deterioration in sunlight, resistant to strong disinfectants and light grey for at-a-glance assurance of proper cleaning. Suitable for conveyor transfers, automated stacking, high-pressure washing and broad temperature changes thanks to material stiffness, dimensional stability and high impact-resistance. Blind find bottom design means SmartBasket™ easily finds its secure locking position for fast, stable stacking. Ergonomically designed lateral hand holds provide maximum grip, comfort and confidence during handling. Designed with a smooth interior to enhance the welfare and protection of day old chicks. Small ribbons in basket floor prevent splayed-leg chickens. 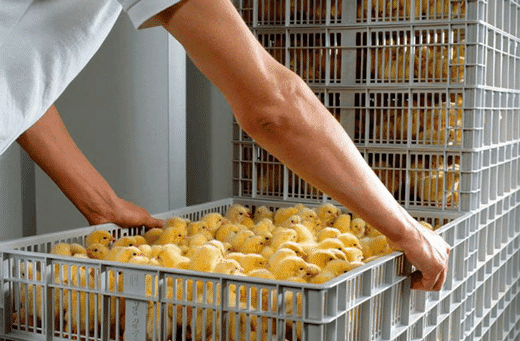 Extra side bars and specially adapted bottom design prevent any part of a day-old-chick from protruding through the crate, for extra security during handling.